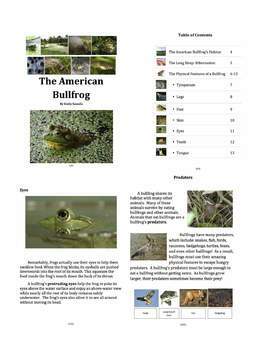 - 21 pages of fascinating text that will teach students all about the American Bullfrog. Topics include the American Bullfrog's habitat, physical features, life cycle, predators, and prey. -10 pages of graphic organizers and activities that will help students to extract and synthesize details from the text. American Bullfrog: Text-Based Exploration of a Fascinating Frog by Emily Sassola is licensed under a Creative Commons Attribution-NonCommercial-NoDerivs 3.0 Unported License.